I think that this fairing has finally found its home! And I like the clear lens idea BTW. Been keeping emergency rooms busy since 1900 at least!! I think I may have finally found a name for the bike. My buddy Dave, who's garage we all work on our bikes in, thinks that the clear lights with the retro fairing on bike will give it a 70's futuristic look ala Logan's Run. I love it! That could help you with a color scheme too, if you haven't already settled on one. I seem to recall a lot of matte silvers and grays on that film but I could be dead wrong. True, the vehicles are all silver. Someone just pointed out to me here at work that the crystal in their hands turned red after they turned 30 so maybe a nice metalic ruby red. 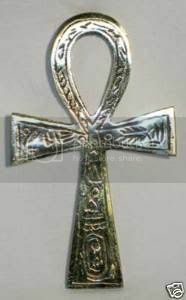 Re: 1977 KZ400 Build..."Logan's Run"
Maybe a couple of ankh symbols for sanctuary from the film on the side covers.